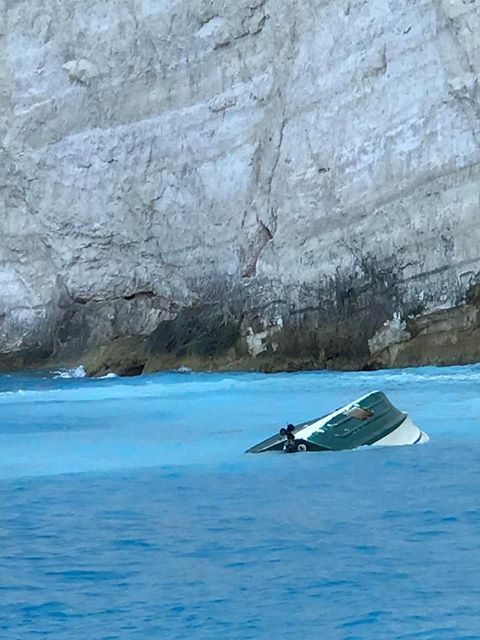 British holidaymakers have described scenes “like Dunkirk” after tons of rock fell from a cliff face onto a packed tourist beach on the Greek island of Zante. Lynette Bridges, 58, from Hordon-on-the Hill in Essex, said her tour boat had just pulled up to the popular Shipwreck Beach when an enormous sheet of stone crashed into the sea, capsizing boats and flooding the crowded beach. “We started to hear this almighty cracking sound and the first lot came down quickly followed by the second lot,” she said. “The noise and the sound and the amount of rock that came down was unbelievable,” she added. Video footage of the moment showed the rock split and drop onto the shore, sending up a cloud of dust and speeding waves inland over the assorted tourists. Sharon Robinson Palmer, also 58 and from Essex, said there were people snorkelling and sunbathing near the limestone cliffs when the landslide struck. Rescue services with sniffer dogs are searching the beach for possible victims. Josh O’Connell, from Kilkenny in Ireland, estimated there were more than a dozen tourist boats in the bay, and between four and five hundred people in the area. He continued: “I thought more was coming and with the size of the waves coming towards me I just started running. He described the aftermath as “chaos”, with families and children running to get to safety on the boats. The coastguard later said everyone who had visited the beach on tourist boats had been accounted for.